Whenever I go to Makati Medical Center alone and I need to either have breakfast or lunch there, I make it a point to go to Tapa King. I feel I’m getting my money’s worth every time I eat there because they serve really delicious beef tapa (cured beef). I heard from a fellow diner that he had Tapa Flakes before, and he said it was good. Curiosity got the better of me, so that’s what I ordered for lunch. 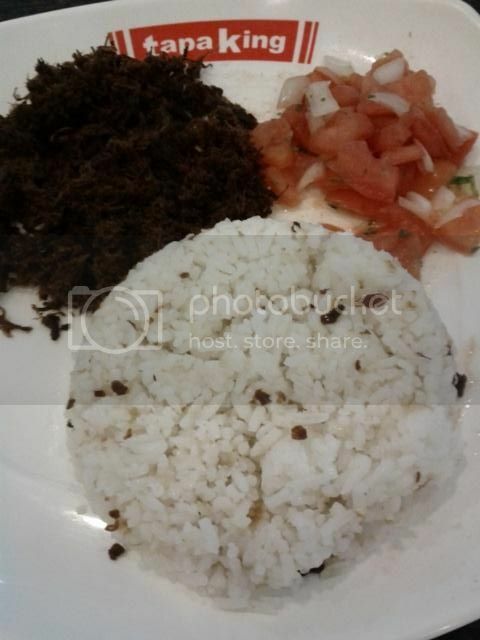 Tapa Flakes are bits of beef marinated in a special seasoning and served with garlic rice and tomato salsa. The first thing I noticed was that the Tapa Flakes were darker in color than Tapa King’s usual tapa. Also, unlike the other tapas (Tapa King, Tapa Queen and Tapa Prince), the Tapa Flakes are crispy, but like the rest of the classic favorites, these Tapa Flakes are tender and full of flavor. Crispy plus tender plus tasty equals great lunch! This entry was posted in Tapa Flakes, Tapa King. Bookmark the permalink. We will eat Tapa kahit ano pang form yan!